WiFi on the freerunner has some problems, see WiFi Managers. So I decided to start a project to concentrate all the ideas about an ideal (but simple) GUI applet to manage WiFi connection. The project is actually only a prealpha prototype to discover issues and implementation solutions. When ideas and needs will be clear it may be reimplemented in a more elegant way and with your preferred toolkit, now I'm using what I know better, C++ and QT with fast and dirty coding style! It actually manages wpa_supplicant trough dbus and spawns udhcpc directly, replicating some Network Manager features. When a solid rock network manager will be available for the freerunner, and will handle the specific device capabilities/issues, NWA may be migrated to use it's api. The main target is to use wpa_supplicant in a decent way, e.g. as a supplicant! You'll add your preferred wifi networks at home, at work, at your friend house and so on, and it will scan silently for them, connect when they are available and show a notification window/sound to alert you. configure advanced network properties, WPA enteprise, EAP, LEAP, TTLS etc. The user should be able to use dhcp or static ip addresses. It has to be able to restore some default DNS when exiting dhcp (eg. opendns, last used dns ...), suggestions on possible solutions are appreciated. Some special handling is required for Window Managers that does not support sys tray specification (like E17). The last has to be defined better, should you signal a new network only one? only one per session? etc. Popup and/or vibration has to be associated with sounds to warn the user not looking at the device. As alternative some software synthetizer may be used. The configuration file should be in xml format, a default one will be provided that scan and connect to any open network, so the user may use NWA out of the box. When the user changes settings, the default file is copied in $HOME/.nwa.conf, that one will override the default. NWA prefers FSO frameworkd based distro but should be capable to run on everywhere, actually it works fine on my laptop too. With some AP the atheros power managment creates problems, NWA should support disabling it. It has to restore automagically the connection on suspend/resume cycles (the prototype does that without any special code as the nature of how it works). Another problem is that wpa_supplicant when connects to a networks signals only the state change and not the network id or network dbus path. This is a big problem as I would have the dhcp/static ip configuration associated to that and not to the essid as it may be the same between different networks. Using the bssid to disambiguate the network may not be always possible for example when connecting to two big WDS networks with the same essid and thousand of AP. as wpa_supplicant does not signal the connected network we have to retrieve the essid with standard AF_INET ioctl, so qnetutils.cpp has to be improved qnetutils.cpp now read the essid and bssid of the associated network. The qt stylesheet has to be improved. A startup script, launched when supplicant association is complete, is already implemented, it's a crude way to disable power management if needed. Actually destroying a running thread when application quits leads an "application crashed" on E, I'm not caring of it now a better clean and quit handler has to be implemented. To play sounds notification spawning a shell sound player may be weight and slow, so I think it's better to use FSO, while to have speech synthesis the script approach may be acceptable, parameter passing has to be implemented in the configuration file (network name, ip address and so on) just use $IFACE$ and $IP$ when you want it be automagically replaced with their respective values. It seems as udhcpc when got an ip address set/unset/set_again the ipaddress, this is strange. The problem is not present with dhcpcd. Updates: this happens with udhcpc on a Cisco MDS wifi network and not with common AP. The first prealpha prototype is quite ready, it was developed on debian with Matchbox and matchbox-panel as sys trayer, under E qt balloon sys tray messages are showed in a random position on the screen, so some special work around is needed a primitive and animated "tooltip" was implemented. Multiple not overlapping message showing are not supported a queue handler has to be implemented. I preferred to avoid qt sys tray baloon message on not-E wm too, as if the tray icon is in a middle/left position (becouse other tray icon are present), in some cases they are not readable. It seems that udhcpc at exit does not deconfigure the interface anymore, strange I was quite sure it did before, this results in no "down" sound/notification when nwa disconnects. Make sure your ar6000 kernel module includes the following patch: http://docs.openmoko.org/trac/attachment/ticket/2333/0001-ar6000-minimise-possibility-of-race-in-ar6000_ioctl_.patch otherwise you will experience a random kernel oops when you quit NWA. 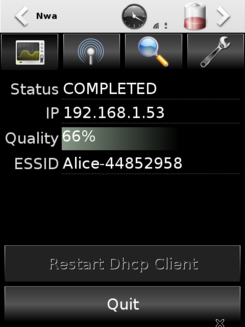 0.03, added support for static ip configuration, some other changes may break usability be warned. NWA should work out of the box at first startup on the freerunner as it has some hardcoded settings in the xml parser and in the default configuration file targeted for the freerunner, it should connect to any open network as one becomes available without further user intervention. This is only for demonstration pourpose or when you are traveling :), in normal cases you have to add/remove/edit/enable/disable networks. Go on the "scan page" and click on "scan", after a bit available networks should appear, click on one of them and a wizard dialog will help you to configure the network with every kind of parameter wpa supplicant supports. I was able to add my home wpa/psk network and my campus EAP/TTLS/PAP radius enterprise network without problems. The network is added and enabled, wpa_supplicant will decide how and when connect to it based on it's status priority etc. Go on the "network page", you'll have two box, the upper contains the enabled network, the bottom the available (disabled) network. Clicking on a network shows a menu that permits you to do the needed operation. So if you want to ignore open networks simply disable the "Any open" profile, and reenable it when walking around in the world. This is the FSO ousaged control, so be warned if you enable wifi from external application you'll see NWA working even if the wifi status is "disabled". The autoenable button let you choose if autoenable the wifi resource at startup. On WM with a standard trayer, NWA will show an icon with current wpa_supplicant status and historical signal strenght indication. Clicking on the icon will show the main window, to hide the main window use your window manager capability. NWA read $HOME/.nwa.conf configuration file, if it does not exists it read /usr/share/nwa/defaultconfiguration.xml. When you change some configuration with the GUI the default file is copied in $HOME/.nwa.conf. basic configuration for the openmoko freerunner. Experimental support for static ip was added, with GUI too. use a format compatible with xml and exec call. eg: "sh -c &quote;xxxx; yyyy; zzzz&quote;"
This is a list of use cases to help in debugging NWA. I use it, if time is available, before pushing a new version to the feed , If some of there are wrong please retrying after opkg remove nwa, opkg update, opkg install and contact me if the problem persists. Feel free to add your custom cases. First launch after installation, autoconnect to the first open network ? Add WPA Radius Enterprise TTLS/PAP network manually ? Work on OM2009 testing v5 + update/upgrade yes "
This page was last modified on 25 August 2010, at 11:21. This page has been accessed 38,891 times.